Forget video messaging, direct share, and whatever happened here. 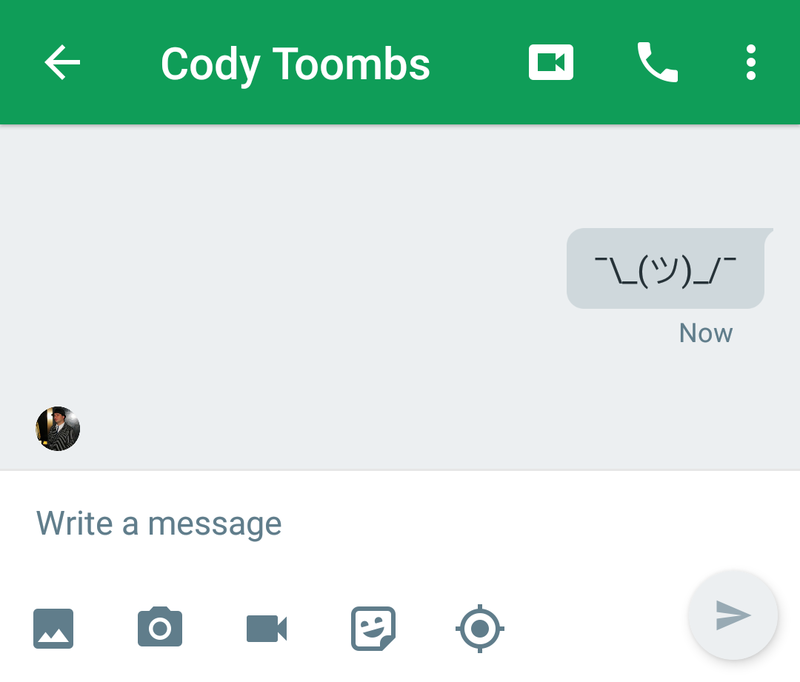 The most important update in Hangouts history finally happened and you're all here to witness it. The Master of Meh has come to Hangouts for Android and really wants you to know it's all okay. It's Shruggie! 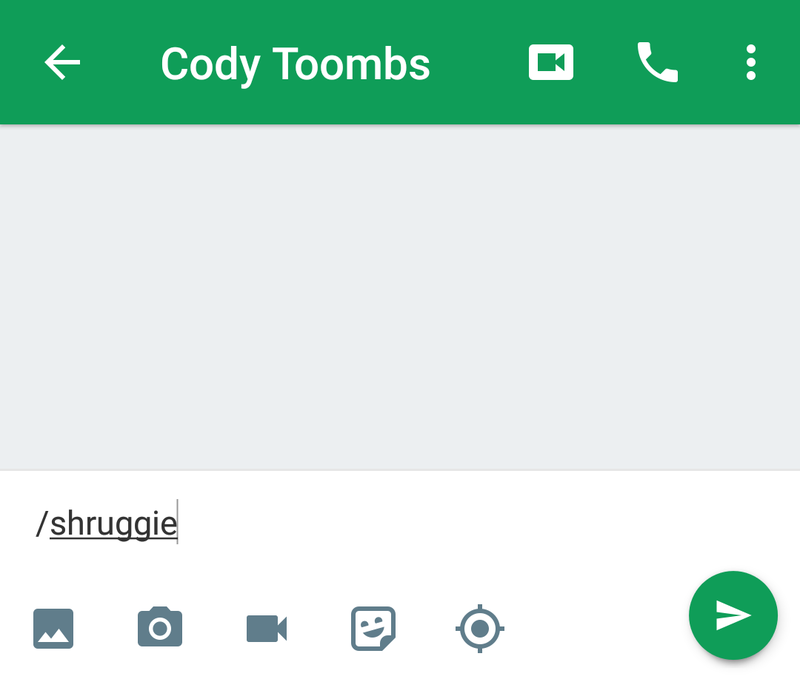 Yep, the latest update brings Google's greatest non-easter egg to the messaging screen in all its unconcerned glory. You're honor-bound to get the update immediately and begin showing just how unimportant things are to you, too. 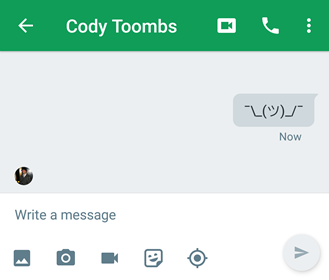 Hangouts finally includes the classiest text art known to mankind and it's rendered in high-resolution Roboto Slab. If you want him on your screen, and more importantly, on somebody else's, just pop open a chat and type /shruggie. As soon as you send the message, watch in wonder as the motionless face and arms take a spot on your chat window – until it scrolls away and leaves an empty feeling behind. Seriously, Shruggie seems to be the only new live feature in this update. I would pick on Hangouts for putting so much dedication into the important things like this, but I'm sure plenty of other people will take pleasure in doing that down in the comments section. In the meantime, there's actually something legit in the teardown. Notifications can be a huge pain if they aren't kept in check. Apps like Gmail will quickly ring out of control if a lot of new messages are rolling in around the same time. The same is true of instant messengers, especially if you've got some overzealous chatters on the other end. The trick with email is to allow filters to help with managing email and determining priority. It's not as easy to do that with messages from other people, which is why some chat systems allow people to determine the importance of their own messages. 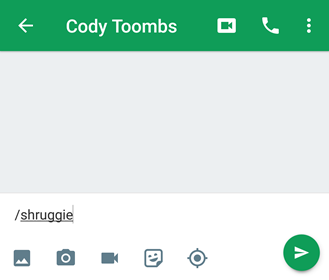 Hangouts appears to be building in the same mechanism to encourage senders to judge how vital their own messages are. The strings below represent three different filtering options users can choose for their needs at a given time. They are able to allow all messages like normal, block out everything, or allow the sender to determine if a message demands immediate attention. There isn't much to go on for details, but this is a very common pattern in many messaging platforms, so there's not much need to guess. If somebody sets their status to only allow important messages through, a sender will be prompted to ask if their message is important. If they respond affirmatively, the message will be sent and an audible notification will pop up. If they don't think the message is that time-sensitive, their message will likely sit idle inside the app until the receiver's status changes back to allow everything, at which point a notification should appear. Now that Google Hangouts will be rededicated to serving the enterprise market, it makes sense to add features like this. It's common (at least in certain countries) for employees in certain roles to remain readily available to their employer and coworkers. They need the ability to set some tentative boundaries while they're at home, and to completely block out all messages during presentations.